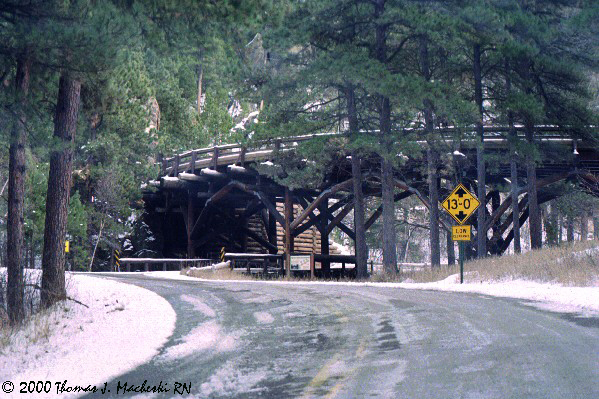 Pig Tails - Ramblings of Mad Shutterbug & the Border Collie Bros.
On one of the approach roads to the Mount Rushmore Memorial, there are two (or three, memory is blurred) of these bridges. The approach comes in over and along a ridge, which provides some spectacular views of teh Monument and some engineering challenges in road building due to the grades. These bridges curve around and pass the road underneath the structure, an engineering innovation to avoid needing to switch-back the road for the grade. Camera is the Nikon EM 35mm SLR I inherited from my friend, film is Kodak but I don't recall which specific film. Also, this was in November, and one of the colder and earlier starts to the Black Hills winter that my brother-in-law had seen for a while. Wow, what a fascinating structure! Is this the road engineering equivalent to railway spirals?